Do you have a Revolutionary War patriot in your family tree? Membership in the Daughters of the American Revolution honors and preserves the legacy of your patriot ancestor. Over two hundred years ago, American patriots fought and sacrificed for the freedoms we enjoy today. 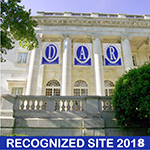 As a member of the DAR, through participation in our various programs and activities, you can continue this legacy by actively supporting historic preservation, promotion of education, and patriotic endeavors. Any woman is eligible for membership who is no less than 18 years of age and can prove lineal, bloodline descent from an ancestor who aided in achieving American independence. She must provide acceptable documentation for each statement of birth, marriage, and death. The first step to membership in the DAR is to gather the genealogical information that you already have and contact our chapter regent. She will guide you through the application process and answer any questions you may have. You do not need to have completed your genealogical research in order to start the application process toward becoming a Daughter. We do require that you have a patriot to complete the application process. If you would like to receive information about joining the Abendschone Chapter NSDAR, please fill out the contact form and we will contact you right away.